Please follow this link to find the new procedures. Informational Sheet: The IACUC has provided a set of guidance documents (Policies, Guidelines, and Informational Sheets) for use when planning animal procedures at the University of Iowa. Informational Sheets provide information about frequently asked questions and represents guidance for best practices. Deviation from the recommendation(s) does not require specific justification. Purpose: This document provides information to aid laboratory staff in best practices for the care of new weanling mice. As a reminder, proper rodent breeding management requires not only breeder pair evaluation, dating of litter births and proper weaning practices, but includes care in the post-weaning period, a time of high stress for young animals. This includes involvement up to 5-6 weeks of age for most mouse strains, sometimes longer for genetically modified lines. Failure to perform proper breeding management steps may result in OAR involvement and fees for your lab. Fill out the “Date Rec’d” line on the cage card as the date you weaned the mice. Place a yellow “New Weanling” tag on the cage cardholder. Place 2 pellets of feed on the cage floor. To prime the water valve press down (do not press in) on the small metal piece in the center of the valve with your gloved finger until water is released before placing the cage on the rack. This leaves some water on the valve and teaches the mice where the water is. If you feel the valve is not working, notify a facility supervisor. Are the pups younger than day 21? You may delay weaning up to day 24 if there is not an additional litter in the cage. This gives the mice several additional days to grow. If small weanlings are an expected phenotype, this must be added to your Animal Protocol. Add additional bedding from a clean cage until bedding is within 1 cm of the bottom of the water grommet. NOTE: DO NOT ADD an entire extra cage of bedding as it makes it very difficult to visualize the pups in the cage and may cause water to leak from the water valve into the bedding. 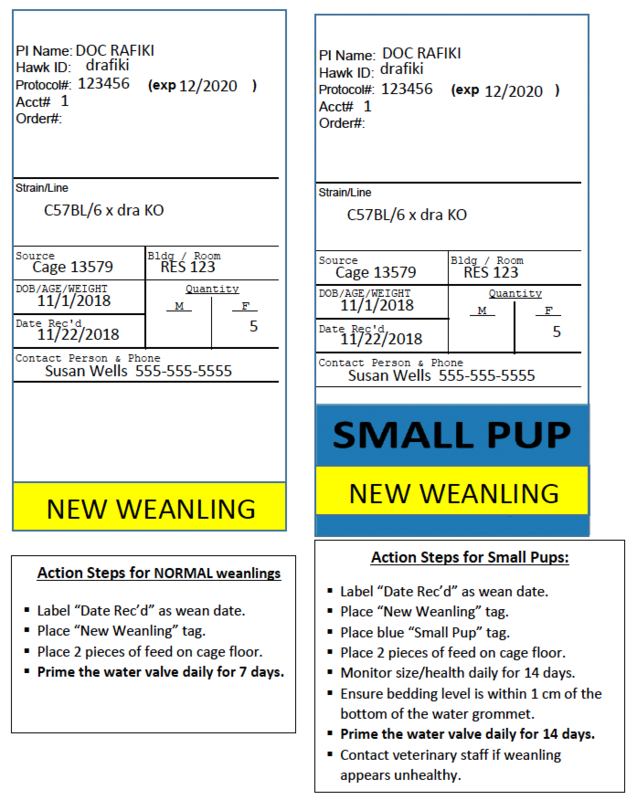 Add a blue “Small Pup” card directly behind the New Weanling card. Monitor health of new weanlings daily for the first 14 days. Each day, prime the water valve (as described above). Optional: Provide NapaNectar or DietGel 31M at the front of the cage. During business hours (7:00am-3:30pm): Notify a caretaker/supervisor of the room and location. NOTE: any mouse strain which routinely requires supportive care for phenotype/strain reasons should be described in the Animal Protocol. Napa Nectar for hydration or Gel Diet for soft nutrition are recommended for animals which require supportive water access. If you have questions regarding the use of these products, please contact your facility supervisor or veterinarian. Are your new weanlings small? Example of 22 day-old mouse pups, one which is acceptable size and one which is too small to thrive without assistance.